Oil changes at Smalley Automotive are very affordable and provide valuable protection against engine damage. We also offer synthetic oil changes. While more expensive, synthetic oils provide a higher degree of protection and don’t typically need to be changed as often as petroleum-based engine oils. Synthetic oils don’t thicken as easily, they’re more effective at preventing engine wear, and they maintain a higher viscosity over a broader range of engine temperatures. Smalley Automotive is a Certified Used Oil Recycling Center. 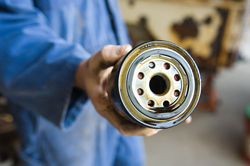 Whether you come to us for oil changes or you’re a do-it-yourselfer who drops off used oil at any one of our locations, you can trust that we’ll dispose of your used oil properly so it can be cleaned and re-used. Learn about the many benefits of used oil recycling. Click here to schedule an appointment for your next oil change.